Old Hat Farm is taking a brief hiatus for the 2018 season. Thank you all SO MUCH for your support over the past two seasons! Please check back in here in January 2019! + why should i sign up? Great food, grown well, very fresh and delivered weekly to a pick-up spot near you. A wide assortment of vegetables – including many that you know and love, but also a few things that might become your next favorites. When the harvest is especially bountiful, we'll share it with you! This means that we'll give you extra tomatoes, say, if the plants are producing wonderfully, and the value of your share over the course of the season will be higher than what you pay for. A weekly newsletter: This generally includes ideas & recipes to help make your vegetables into great meals, reports on what we're loving / struggling with currently on the farm, word on what's going to be in your box next & more. An invitation to the farm for some fun and/or work. We're hoping to plan an on-farm dinner this year, as well as at least one work party (maybe around garlic harvest in July). A clear and direct way to support a form of agriculture that has positive impacts on the health of soils, your health & your community! + How much is in a share and for what price? This year, we've decided to offer TWO sizes of shares! That's right, this year vegetable eaters of all kinds (or two kinds, at least) can get the quantity of fresh produce they want. REGULAR SHARE: Each week you’ll receive 6 - 10 items, depending on what / how much is in season. This is last years share size. We estimate it's great for singles or couples who eat/cook lots of veggies, families, or roommates who like to share. There will also be more variety in the regular share each week. Cost: $475 for 18 weeks of produce. SMALL SHARE: Each week you'll receive 4-7 items, depending on what / how much is in season. It's a better size for single folks or couples who eat out more often, don't like some veggies, or just want a smaller quantity of vegetables each week. Be aware that since many of our fixed costs are the same for small & large shares, the per-unit vegetable cost is slightly higher for the small share. Cost: $350 for 18 weeks of produce. For both sizes, your box will be bigger in late summer – since that’s when most plants are producing their tastiest fruits – but there will be lots of good food inside every week of the season. NB: For those who split a share last year, you are still welcome to find your own share-splitting friend and alternate pick-up weeks (of either share size) with them. We can accept a payment from each of you for 1/2 the share cost. However, since we've added the "Small Share" size this year we will no longer be preparing 1/2 share sized boxes each week like last year. We think this price accurately reflects the value of the produce we grow, but we recognize that our vegetables are not super cheap and we are very open to making creative arrangements to help fit them into your budget. Get in touch if you'd like to propose a trade, or if you live in the Falmouth area and are intersted in volunteering on the farm in exchange for your CSA share. Send us an email! Also, the optional Flower "add-on" costs $60, if you're into flowers. More details about flowers here. + What will be in my CSA box? SAMPLE SHARES: Items in italics would be found in a Small Share. The full lists represent the contents of a Regular Share. A sample late June share: A bunch of arugula, a quart of strawberries, a pint of snap peas, a bunch of radishes, a bunch of scallions, a bunch of salad (hakurei) turnips, and a bag of mixed baby lettuces. A sample late August share: A pint of Sun Gold cherry tomatoes, a few kohlrabi, a zucchini, a bunch of basil, a head of lettuce, two cucumbers, a bunch of carrots, a bunch of swiss chard, two slicing tomatoes and a cantaloupe. A sample late October share: Two heads of garlic, a pound of beets, a winter squash, two pounds of carrots, a bag of salad greens, a few leeks, and a bunch of kale. + How long is your season? We're offering an 18 week CSA program this year. This means that the first vegetable box of the season will be available the week of June 26th, and the last one the week of October 23rd. 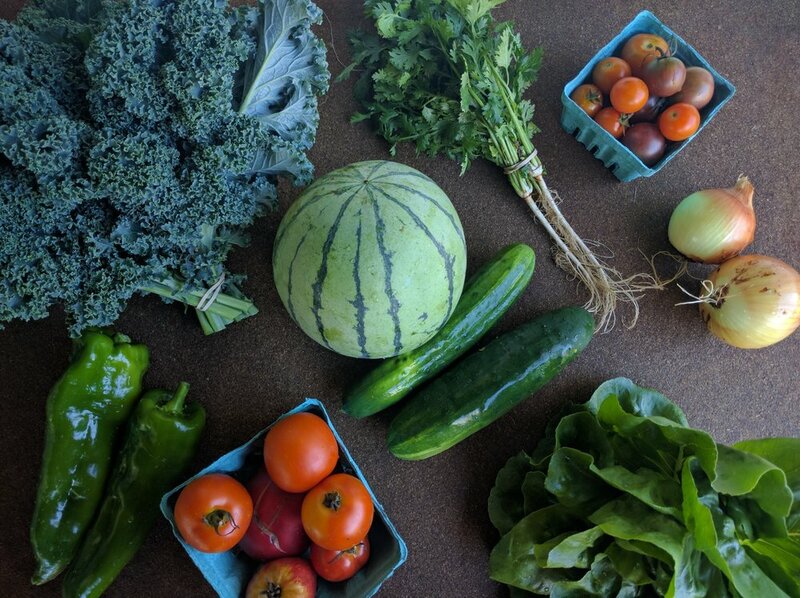 + Where will csa boxes be available? Shares can be picked up at Alex's family's house in York (near Scotland Bridge), between 4 & 7 pm. Shares will be available for pick-up at our house (near Rt 100 and Hurricane Rd) between 4 & 7 pm. + what happens if I'm out of town? Donate your share to either the Greater Boston Foodbank or the York Food Pantry. + How do i sign up? When should i sign up? Sign up as soon as you know you would like to become a member! It helps us hugely with planning for the season. It's easy and you can do it online right now if you want to! Our online form is available here. Soon after you sign up we ask you to pay either in full or half in order to secure your place in this season's CSA program. We'll confirm your payment amount options by email when we get your sign-up. If you'd like to split the payment up, please plan on paying the balance by the first delivery date in late June. If you're more of a check/cash person, we'll send you an email after you sign up about where you can send your payment or when we might be in your neighborhood to meet in person. If you're wanting to pay online, we prefer payments through Venmo, a subsidiary of PayPal where there are no extra fees if you pay with a debit card or directly from a bank account. We'll send details about payment specifics by email as soon as we receive your signup. + what if I'm late to pick-up my share? We understand that life/work can sometimes make it impossible to get to the pick-up spot during the designated hours. That's ok! In Somerville, you're welcome to pick up your share later in the evening OR the following morning. It will be left in the backyard, but it's not visible from the street and it's pretty safe back there. There unfortunately isn't refrigeration, so late pickups are "at your own risk", but I think most people who opted for this option last year found their veggies to be in good shape, even the next morning. In Falmouth, an on-site fridge will also mean an easy late pick-up option. Please get in touch if you have questions that aren't answered here!